In a recent study performed by General Electric (GE), productivity gains resulting from the “internet of things” could add between $10 trillion and $15 trillion to global GDP over the next 20 years. The manufacturing giant reckons the “industrial internet”, as it terms the phenomenon, could find direct application in sectors accounting for more than $32.3 trillion in global economic activity, but expects this figure to reach about $82 trillion – one half of global economic output – by 2025. The study deals with correcting inefficiencies in business processes for major industries. Improving these processes even slightly provides huge cost savings boosting the overall economy. « To read the article, click here. Salt Lake City, Utah – November 19, 2012 – Monnit Corporation (www.monnit.com) a cutting edge provider of wireless sensing technology, today announced an agreement with M2M Data Corporation, a leading provider of remote asset monitoring and management services to the oil and gas, water/wastewater, power generation, and heavy equipment industries. Under the agreement, M2M Data Corp will offer Monnit’s wireless sensing solutions to their customers, allowing them to easily expand the functionality of their existing M2M (Machine-to-Machine) systems. Monnit currently provides over 26 different types of wireless sensors available in Industrial NEMA 4X enclosures. The sensors are designed to detect and monitor various functions that are critical to equipment and asset operation, including; temperature, humidity, water, light, motion, movement, access, voltage, vibration and much more. “We feel that M2M Data Corp’s expertise in industrial markets makes them a perfect partner for us. Our industrial wireless sensors help address the growing demand for reliable, cost effective, wireless sensing solutions that can easily integrate with M2M’s RMS and Aquavx remote monitoring services.” said Brad Walters, CEO of Monnit Corporation. M2M Data Corp accelerates the entire M2M solution process, from conceptualization to commercialization by leveraging rapidly configurable platforms, deep device understanding, and comprehensive integration expertise. In addition to its robust M2M network and application platforms, M2M Data Corp provides capabilities in over 50 vertical markets. “Monnit’s extensive line of low-cost, low-power wireless sensors will allow us to expand the selection of solutions available to our customers. Their sensors will allow our customers to monitor more conditional and environmental variables than ever before.” said Donald Wallace, M2M’s CEO. Monnit is a leader in the design and manufacture of turnkey, self-installing, low cost wireless sensor solutions targeted at the commercial, industrial and consumer markets. Monnit’s sensing solutions are designed to be easily installed and used by anyone wanting to remotely monitor information and activities, including: temperature, access, water, light, humidity, motion, presence, pressure, voltage, vibration and many other conditions in or around structures, machinery, and various environments. For additional information, please visit www.monnit.com. M2M Data Corporation has been leveraging a Software as a Service (SaaS) approach to deliver remote asset and equipment management and advanced remote monitoring solutions since 1999. Serving the oil and gas, water/wastewater, power generation, and heavy equipment industries, M2M’s solutions take distributed asset monitoring and assessment to a new level of accuracy and timeliness. With a track record of transforming data into useful information that helps customers improve operational excellence, M2M is the trusted partner in hosted remote asset management. For more information, visit www.m2mdatacorp.com. Managing apartment properties efficiently, yet cost effectively is challenging. In large and small apartment complexes there’s plenty to worry about without having to spend time and money to manually monitor areas of a building that could be monitored by sensors. Monnit has a low-cost, easy to use wireless sensor solution for apartment property management. Using Monnit WIT Wireless Sensors for apartment property monitoring allows property managers to be notified immediately if any issues occur that could cause damage. Know instantly about water heater leaks, plumbing issues, AC unit failure, and many other things critical to maintaining safe living areas for residents. Monnit wireless sensors track conditions for you, sending the information to the iMonnit Online Sensor Monitoring and Notification System where custom alerts can be sent via SMS text or email. 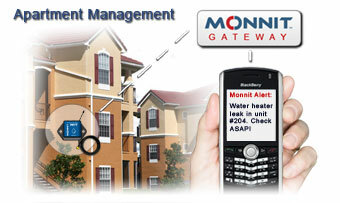 We recommend using Monnit’s affordable wireless water sensors to monitor for plumbing issues. We also recommend using Monnit’s wireless temperature sensors to monitor temperatures inside or outside of tenant apartments and common areas. The following steps will guide you through the process of hooking up the 0-20 mA wireless sensor to your device, and changing the sensor’s information in the iMonnit Online Monitoring System. Hooking up the 0-20 mA wireless sensor to your device. When hooking the 0-20 mA wireless sensor to your device please follow these instructions. For 2 wire sensor integration, connect the red wire from the Monnit sensor to the signal wire of your device, then connect the black wire to the ground. For 3 wire sensor integration, connect the red wire from the Monnit sensor to the signal wire of your device, then connect the black wire to the common ground. Setting up your sensor application in the iMonnit Online Software. • Log into your iMonnit online account. • Click the “Calibrate” tab. • From the calibration screen you can change the calibration of your sensor. • The screen will show the last observed reading from the sensor. • Enter the corrected value (what the reading should have been) in the “Actual Input” filed. • Then click the “Calibrate” button. • After clicking the calibrate button, click on the “Edit” tab to customize the unit of measurement for your sensor. • Under the “Data Transormation” section, you can customize the format for your application. • Set the custom application values for the low and high readings. • Enter your custom application’s measurable unit type in the “Label” field. • When clicking on the “History” tab, you should now see the data in your custom format.